Who says Pakistani literature was a relic of the past? 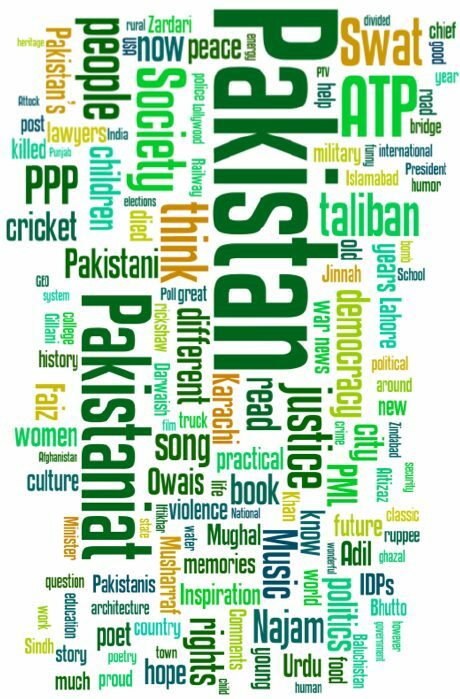 If anything, Pakistani authors have a global audience today, and our writers are now the greatest harbingers of Pakistanâ€™s complexity and nuance in a way that the embedded media can scarcely fathom. 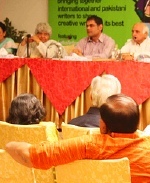 The first literary festival took off in our cosmopolitan melting pot, Karachi, in March. 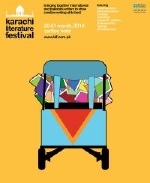 The Oxford University Pressâ€™ (OUP) dynamic head Ameena Saiyid, and the British Council, together organized the Karachi Literature Festival (KLF). Asif Farrukhi, the premier litterateur of the metropolis was central to the festival. Farrukhiâ€™s comprehensive command of Urdu and English literary currents, and the stature which he has earned with his hard work, ensured that we were all set for a fabulous gala. We arrived just in time for the launch ceremony that was held at the British Consulate. It was quite a journey from the Carlton Hotel to old-world Clifton â€“ a mini-bus that dazzled with literary icons of our time: Iftikhar Arif, Intezar Hussain, Masood Ashâ€™ar and Shamsur Rehman Farooqi from the world of Urdu. The front seats were occupied by the petite and resplendent Bapsi Sidhwa, the contemplative Zulfiqar Ghose and the younger British Pakistani writer Sarfaraz Manzoor, whose book â€˜Greetings From Bury Parkâ€™ has created waves across the English reading world. Sunil Sethi, a literary connoisseur from NDTV, and myself â€“ straddling between worlds of literature, journalism and gritty policy work â€“ chatted at the back as I explained the contours of the literary scene in Pakistan: what Intezar Hussain meant to all of us, as the last of the South Asian giants whose familiarity with classical mythologies and twenty-first century sensibilities were unmatched. The next two days were frenzied but edifying. In session after session we heard new and established writers interact with their audience and readers. Grumblings were also heard that there was an Urdu-English divide. As I interviewed Fahmida Riaz for a documentary, she pointed out that the event made her feel a little out of place, as the English world was dominant, and middle class writers in Urdu and regional languages could hardly be â€˜equalâ€™ participants in this power matrix. However, the event as it rolled out challenged many such notions and assumptions. There was a Mushaira, discussions on Urdu and regional writers, as well as on the value of translations. Kishwar Naheed and Haris Khalique arrived a day later due to the riots in Islamabad. Obviously the miscreants and their sponsors cared little for what was happening in the South. But the two arrived with a bang and took over the second day. There were candid confessions and iconoclastic statements from Naheed, and Khalique charmed everyone with his gift of the gab and his radical poems. Mujahid Barelvi, Ghazi and Sadeqa Salahuddin and many others were found at various sessions, intrigued and pleased by what was happening in their city. Eminent poet Zehra Nigah started the festival with a detailed session, and Irfan Husain had flown all the way from London to be a part of this historic occasion. Maniza Naqvi, another prolific writer, had come from Washington. Naqvi puts me to shame: I had to be away from a multilateral institution to dabble in writing while she works hard and also manages to produce a book each year. Two omissions were glaring: Ali Sethi who could not make it due to his tours abroad, and Feryal Ali Gauhar who perhaps was not invited. Gauharâ€™s invaluable contributions needed to be showcased at the festival, and hopefully next year this would be rectified. However, it was the discovery of Sadia Shepard that was most delightful. Her book, â€˜The Girl from Foreignâ€™ is a brilliant account of her family history, and the narrative traverses boundaries and cultures, revealing lifeâ€™s kaleidoscope in its full glory. Sadia is a daughter of a white Protestant father from Colorado and a Muslim mother from Pakistan who at thirteen, discovered that her maternal grandmother was a descendant of the tiny Indian Jewish community. In a session that I moderated, Sadia read excerpts from her book, and spoke of the mellow tales in her confident voice. Not unlike her writings, Sadia also happens to be a beautiful woman. How could such a moot not remember Qurratulain Hyder and her legacy? KLF had asked me to moderate this session, which was packed with heavyweights â€“ Intezar Hussain, Fahmida Riaz, Dr Arifa Syeda and Aamer Hussein. Much was said about the late author, and a split emerged along ideological lines, noting how the Progressives did not approve of Hyder. Fahmida Riaz insisted that the Communist Party was pro-Pakistan as it supported the latterâ€™s creation. The invective against Communists by labeling them anti-Pakistan was therefore spurious. The session, alas, was an hour long and much was left unsaid. This festival finally introduced me to Aamer Hussein with whom I had corresponded, but had never met. 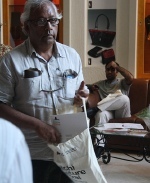 Hussein is an author of five collections of short stories. I managed to get a signed copy of his recent novella, Another Gulmohar Tree at the festival. He is a writer who belongs to a world of letters which was lost a long time ago. During the session on Hyder, he spoke on how the Urdu author influenced his writing in English, and he also related memorable anecdotes. Privately, he mentioned how Hyder was averse to everyone calling her Apa: she was Miss Hyder, a composite, modern Indo-Pak-Muslim character at the end of the day. Our short sighted state has disowned her, much like her true predecessor, Ghalib. The highpoints were sessions with Mohammad Hanif and Mohsin Hamid that drew large crowds. Hanif was earthy and extremely funny while handling the questions. Hamid was self-assured and faced a few hostile remarks with tact and charm, even when the commentator was downright critical of his works. 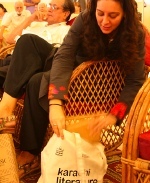 H.M. Naqviâ€™s â€˜Home Boyâ€™ was also launched at the literary festival. It is a novel that will be talked about for some time to come, given its multi-layered plot and well-sketched characters. Naqvi has emerged as our new literary star. 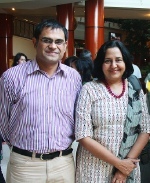 Naqviâ€™s wife, Aliya Iqbal, one of the brightest women I know, was also present at the event. Meeting her after a decade was a pleasure. For me the KLF allowed me to reconnect with many of my Karachi friends and comrades. My dearest friend Rabab Zaidi, development professional turned restaurateur, the uber-talented Mehreen Jabbar, Farjad Nabi, the off-beat filmmaker, Indian journalist Mayank Austen Sufi, Sahar of PANOS-South Asia, writer Themrise Khan, Ali Abbas Inayatullah, Samiya Mumtaz the organic farmer, and our new Roohi Bano, were all dropping in and out of the festival. Writer-activist sisters, Beena Sarwar and Sehba Sarwar were also there, fully immersed in the vibrant milieu of the festival. Above all, the event enabled me to meet Nahid Azfar, the widely-read and gifted artist-writer who was conspicuous by her grace and elegance amidst the crowd. Another session I moderated was on Literature and Sufism. The eminent poet Mahmood Jamal has put together a remarkable anthology of Sufi verse, including some lesser known poets. His readings were followed by Samina Quraeshiâ€™s introduction to her new book: Sacred spaces â€“ a journey with the Sufis of the Indus. Quraeshi also read excerpts from her book and took the audience deep into the Sufi arteries that run alongside the eternal river. Amar Jaleel could not make it, so I invited Fahmida Riaz to recite her translations of Rumi in tarranum. In an exclusive session later, Fahmida Riaz spoke about her style of writing, and recounted how her early poems provoked reactions from conservative critics as well as from her peers. She took us through her struggles, exiles and creative adventures. 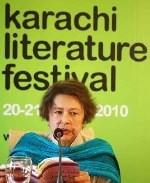 Truly, she is the greatest of Urdu writers today â€“ her prose, poetry, translations, and her ability to be completely bi-lingual, make her unique among the senior ranks of Pakistani literati. Her genius shines even in these gloomy times. I could not attend some events as they clashed with my hectic schedule of moderating, chasing writers and preparing for the sessions. The discussions on Karachi were lively and heated. The relationship between literature and activism also came under the spotlight, and divergent views only testified to the richness of the subject. A major headway has been made and Ameena Saiyid has dared to begin. Putting together the first of such festivals is no ordinary achievement. It is heartening to see how events such as this can take place, and the hope they can instill, in the land of suicide bombers, adventurers and charlatans. I canâ€™t wait for next spring. Raza Rumi is a serial blogger and founder of Pak Tea House, where this was first published. Such literary activities are a reminder that Pakistan has resilience towards militancy; only enlightened minds can counter the baseless propaganda being waged by the Taliban apologists. This war of words must not be abandoned for this is the least that we can do for our brave soldiers.